The process starts with getting your Learner's Permit, then your License. After getting your card, you start looking for the perfect car that'll suit you and your family. Finding the right car can be an extremely long and challenging process. There are so many different resources out there providing you with competing information about what you need to look for when shopping for a new car. 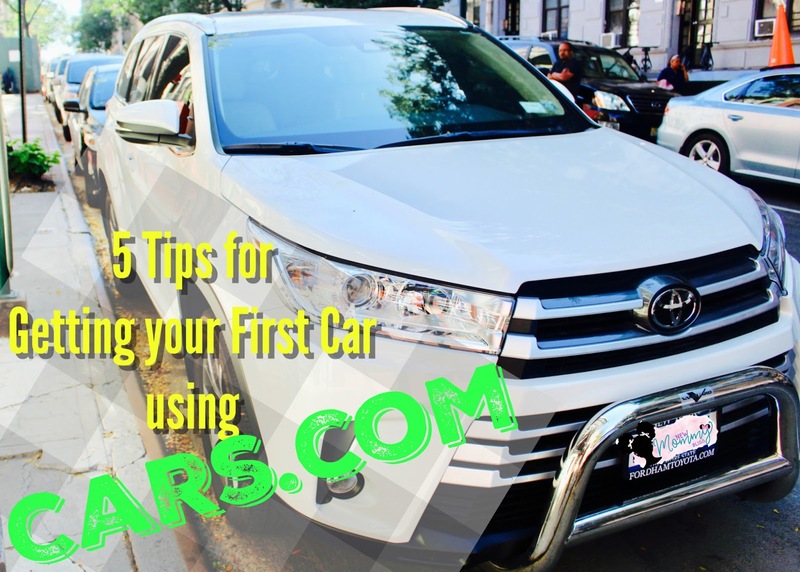 Let me give you 5 Tips you need to find the right car for you and yours. Tip #1 For starters, the most important tip to finding a car is performing the right research. You can’t make the right purchase without knowing the facts about the make, model, and price of your prospective car. Cars.com gives you that. I have the privilege of knowing a lot about cars thanks to my brother, but many of you may not have had the same automobile education. 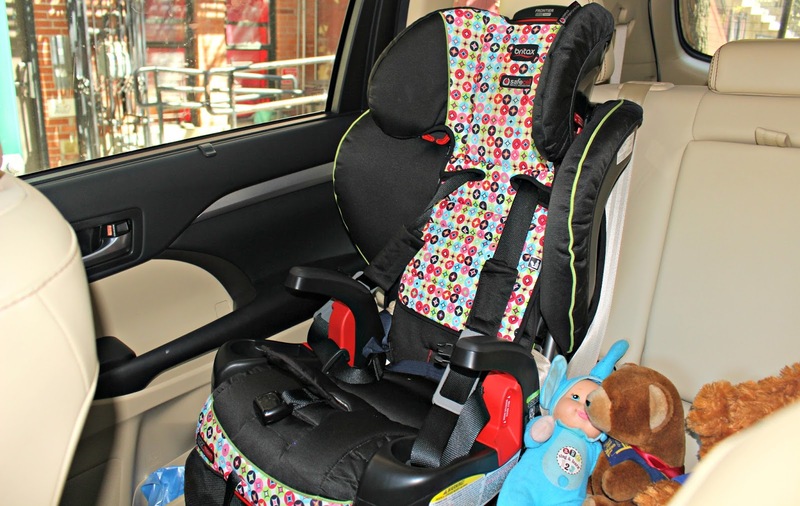 For my first car, I'd love something safe that has enough space to fit a kid with long legs in her spacious Car Seat, as well as all our shopping bags. Once you've made your list of at least 3 cars, move on to Tip 2. Tip #2 Set your Budget. Now that you've made your car choices, make sure you give yourself a cut-off so you don't go over your price limit. Another thing you can check on Cars.Com is if they have special offers. 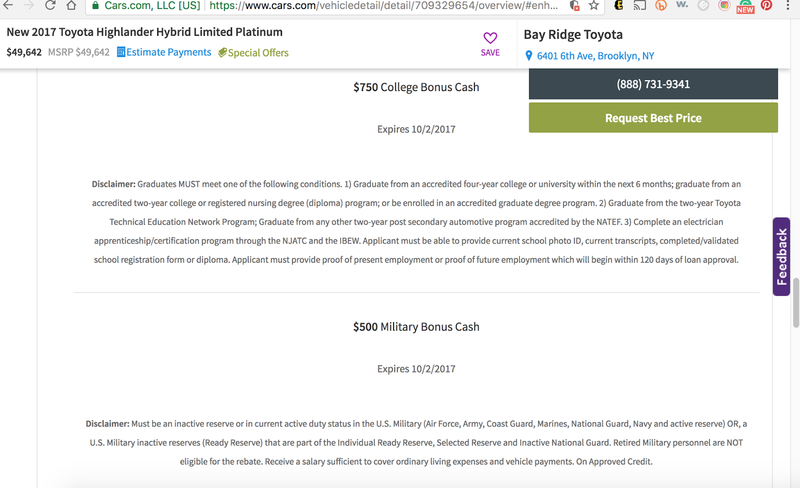 I looked into a Highlander Hybrid and saw that they offered a $750 College Bonus Cash and a $500 Military Bonus Cash. Those cash bonuses certainly have limitations, but it's a great deal being added to your car purchase. Tip #3 TEST DRIVE! Test driving is very important to see how you feel when driving the car. I recall when my mother was trading in her 4runner for a Highlander and we were test driving the cars. She felt the difference in the smoothness of the rides and the height difference you feel when driving. I've driven my mom's old 4runner, my brother's Old Acura, and our current Highlander and would definitely pick the Highlander due to its smooth riding and how great I feel driving it. Tip #4 Used Cars are just as great. I've known people who found very affordable high-grade cars and minivans at prices they could only dream of in those conditions. Never push the idea that Used Cars aren't good because they had prior owners. Even New Cars can sometimes be Lemons. Tip #5 Do NOT settle for less. When we were making the car purchase at the dealership, there was a lot that the people didn't tell us about our purchase. We'd already lost that initial deposit and decided to cut our losses and just try for a newer edition at a new place. This is why researching is truly important! We settled for what they had and didn't fight for what we really wanted. I'm hoping that these 5 simple tips will help you save big bucks and find the right car for your family. Let me emphasize the importance of doing your research, knowing your stuff and taking your time when car shopping. Following our tips will definitely help you make the right purchase without buyer's remorse. Doing something as little as Step 1 can save you thousands of dollars! Purchasing a car doesn’t need to be complicated and stressful. Make it Fun and go get your car! I've never shopped with Cars.com but I have looked into their vehicles when searching. For some reason their prices just seem a lot higher than most dealership so I've never purchased with them. Those are great tips however, and ones I use myself when vehicle shopping.